Mr. Q picked this table up in the middle of last winter. Trust me when I say this picture makes it look nicer that it really was in person. There are some big oily stains and paint splotches on the top. 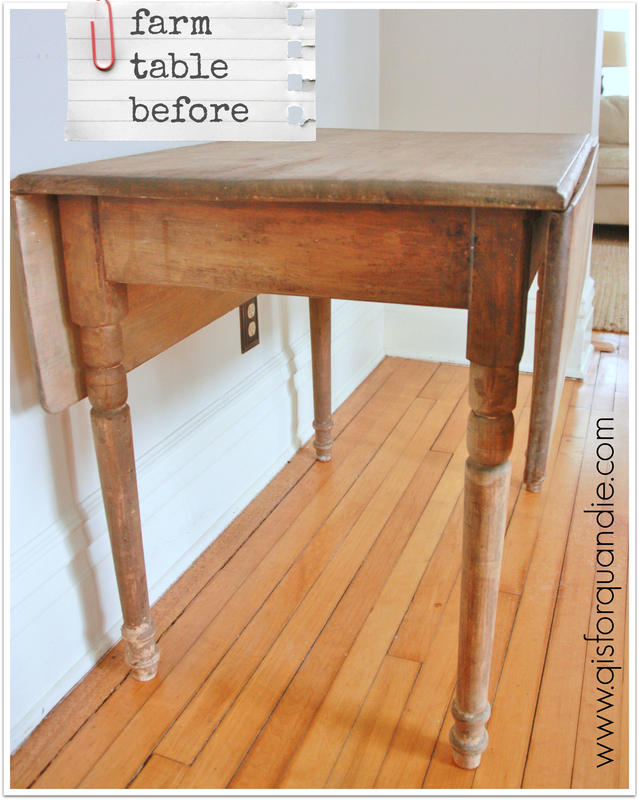 I had visions of this table ending up all chippy and farm fabulous, like this one from pinterest, after a coat of milk paint. 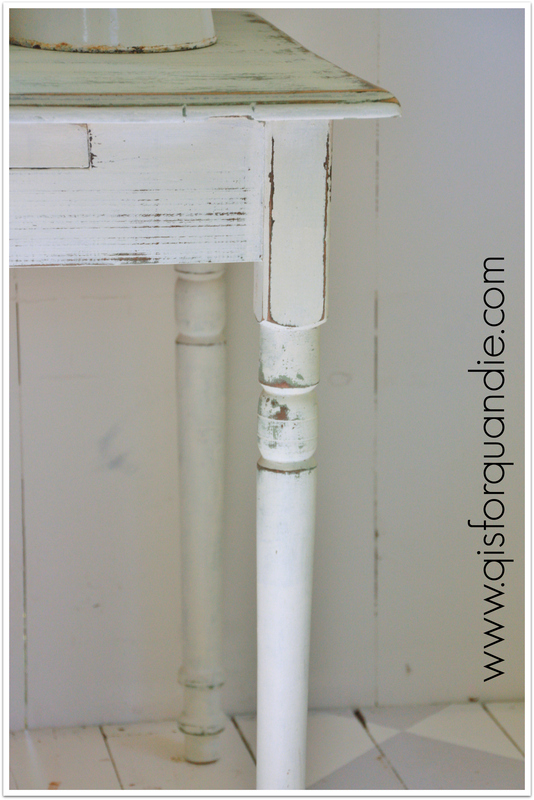 So, I painted it with MMS milk paint in Luckett’s Green. And all of those oil stains came right through, and half the paint chipped right off the top. Not exactly what I was going for. 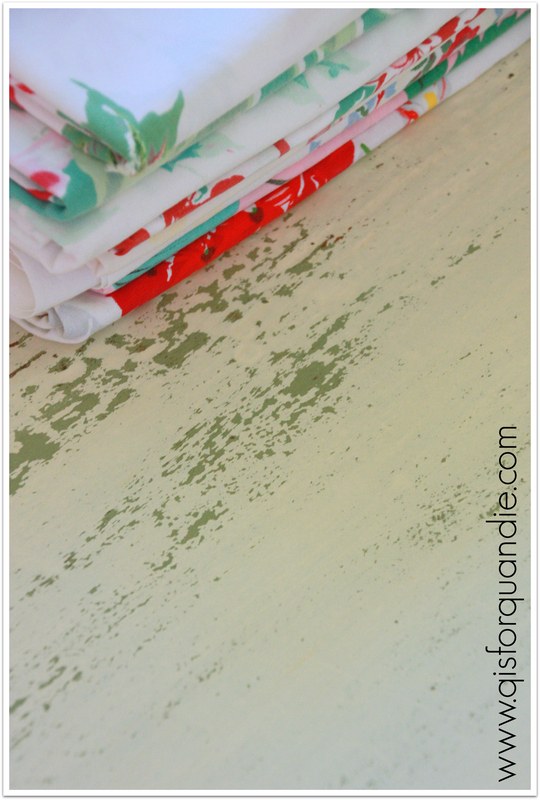 Then I did what all good ostriches do, I buried my head in the sand by throwing a sheet over it and using it as a workbench for the next six months. But last weekend I decided to give it another go. I added a couple of coats of MMSMP in Linen over the green. I did not add bonding agent because I still wanted a chippy shabby result, but in a good way. I really thought the Linen would chip as much as the Lucketts did. I also thought the oily stains would continue to seep through, but I tried it anyway. And for some reason, none of that happened! Really. I have no idea why. So then I sanded the crap out of it and ended up with this. Not quite the super shabby chippy look I wanted, but it will have to do. And remember the oak chair I bought at the ‘breakfast meeting’? 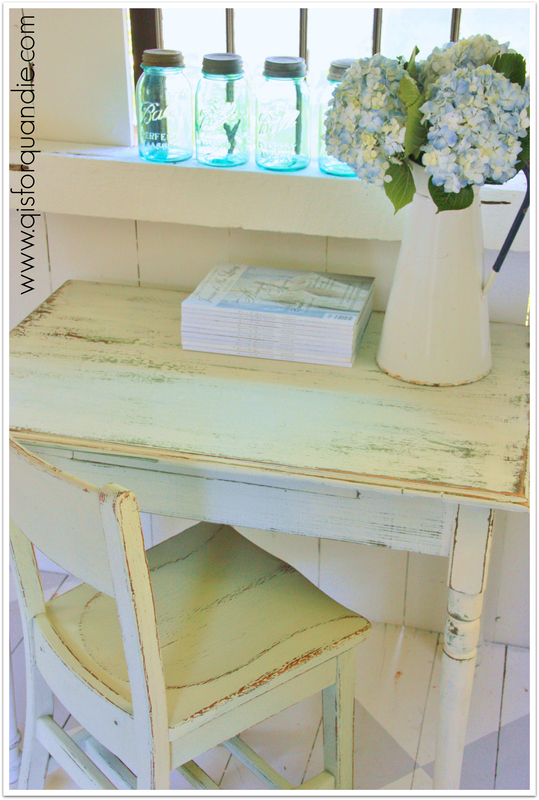 I used the left over paint from the minty fresh vanity and painted the chair. 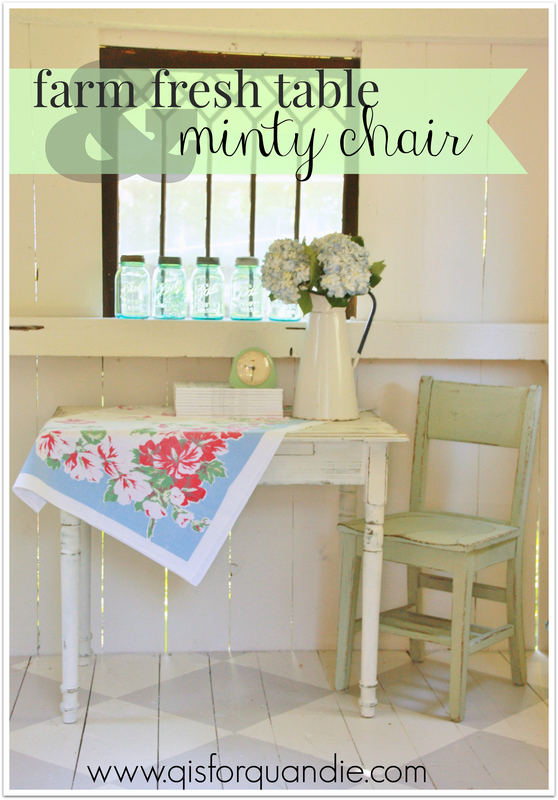 Now I have a pretty decent farm fresh table and minty chair. I think the table is more versatile without its leaves because it can become a desk. Plus, they were seriously lacking in structural stability, so I took them off. This duo would be great tucked into the corner of a room. Just enough space for your laptop. It would also make a fun alternative bedside table, pair it up with something mismatched on the other side of the bed, all of the cool kids are doing that these days. Or, go ahead and use it as a small table in the kitchen. So many possibilities for a farm fresh table like this one. Previous a ray of summer sunshine. Isn’t it nice when a piece of “crap” turns out so pretty! Green in any shade is my favorite. (Perhaps that is why I work in the financial sector??) Great table! Ha! Me too. Are your eyes green too? Mine are. Great color combo and it looks great. Love Lucketts Green! Thanks! That Lucketts is a fab shade of green, isn’t it? It never ceases to amaze me what paint can do to (can I say?) charm a piece. I am impressed you persevered on this one with oil on the top but it sure paid off. You would think I’d be used to it by now, but I am always still amazed at the difference a little bit of paint can make! Smart idea to remove the leaves! 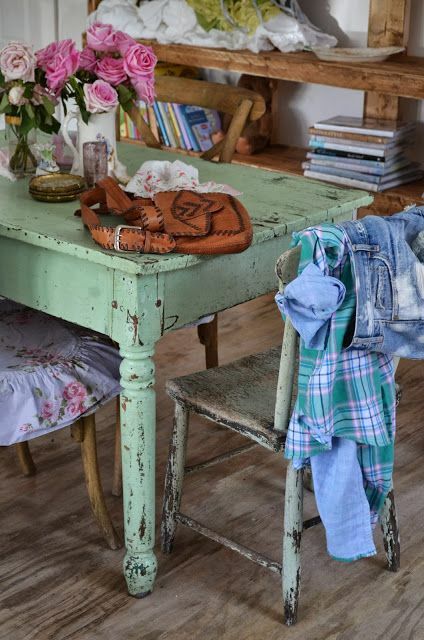 You’ve just given me some inspiration for a drop leaf table I’ve had for a year (and using it as a prep space for other projects! Ha! 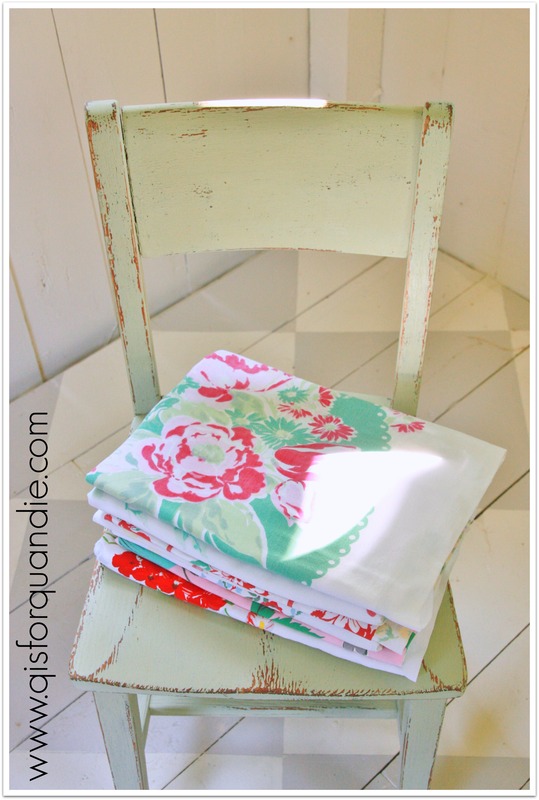 )…And I love the color combo of the green and linen…..very nice! Yeah, the idea to remove the leaves kind of just came to me after seeing so many fab chippy farm tables on pinterest with no leaves. Somehow they are just far more charming without their leaves!